With Queensland’s population hitting the five million mark, experts say the housing market is set to benefit. The latest Australian Bureau of Statistics data shows Queensland’s projected population is set to reach five million this month, translating to a strong demand for property throughout the state. REIQ chairman Rob Honeycombe says the real estate market, and the wider economy, will benefit from such strong growth. “Queensland grew by 81,000 people last year, and we were the most popular state for internal migration, growing more than any other state in the year to September 2017,” he says. Overseas migration added 31,000 to Queensland’s population, which was almost 40 per cent of all new residents in the year to September 2017. “Last year, $54 billion of Queensland residential real estate was bought and sold,’’ Mr Honeycombe says. With more people moving to the region seeking a sea change and waterfront living, unit developments surrounding the Sunshine Coast University Hospital and health precinct are becoming magnets for both owner-occupiers and investors. Local developer RGD Group’s North Shore, Salt, Waterline and Aquarius at Oceanside Kawana have achieved record sales, with 240 waterfront apartments adjacent to the new hospital being sold across the four sites over the past 24 months. 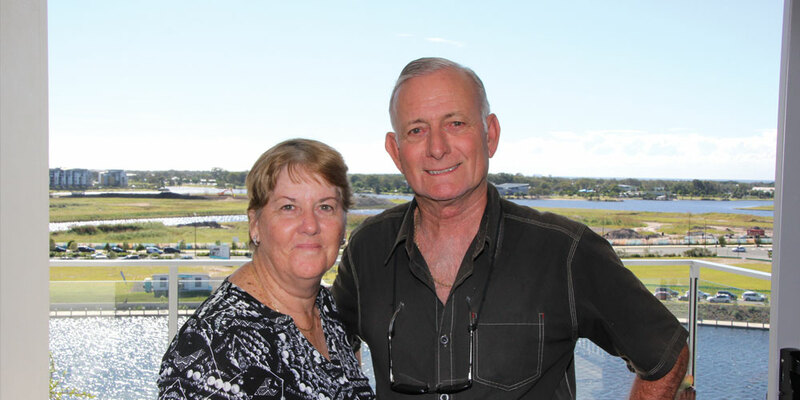 Former Palmview residents Cliff Smith and Alaine Hurman are among many locals who have realised the benefits of the precinct, having already bought an apartment to live in and one to rent out. They have also bought a third off the plan for RGD’s latest development – Southbank. Mr Smith says they first came across RGD’s North Shore and Waterline projects in October 2015 and immediately, decided to plan their “sea change” from small acreage to take advantage of the perfect combination of a lifestyle location that is also close to everything. “We wanted more time to enjoy the cafes, restaurants, shops and green space areas from a waterfront location with spectacular lake and ocean views,” he says. “It wasn’t a hard decision because it’s so close to major infrastructure and the planned CBD is a real positive for future asset and rental growth.” Ms Hurman says the apartments had everything they needed, from the spacious and practical design of the kitchen to the amount of storage throughout. “The wrap-around waterfront balconies offer several outdoor living options and the multi-purpose room is perfect for my craft room or Cliff’s train set. “It also has two side by side carparks plus additional basement storage, which was also a high priority for us,” she says. Mr Honeycombe says people around the country continue to see value in the Sunshine Coast real estate market. “When real estate performs well, everyone benefits,” he says.